Aaron and his crew were amazing. He is very professional, extremely knowledgeable, easy to work, his goal was to always work for the customer and do everything possible to make it a good experience. They spent days making sure everything is properly priced and staged to make the home inviting and taking the time to cover the flooring and bagging up all the trash. We were amazed at the job they did considering there was 60 years of accumulation and that there was hardly anything left. Even though it was a time of loss they made the whole experience bearable. Thanks again. We used Aaron's Estate Sales to run the estate sale for my late grandmother's possessions. Aaron and his team were great to work with. The estate sale was a huge success and we were very happy with the turn out. Aaron came recommended from the broker we were using to sell the house. My grandmother was once an antiques dealer, and he knew his stuff when he came to the first consultation. The sale was run very professionally and the majority of the items were sold. Aaron's team came in 2 weeks early and took charge of the entire project start to finish! They inventoried every item (50 years worth), did the necessary research to provide competitive pricing, and eventually staged the entire home with displays, cameras and supervision to ensure a secure, safe, and efficient sale. Aaron's skill in pricing was key to generating a profitable and complete sale. They conducted a 3-day sale, which generated thousand of dollars while attracting hundreds of visitors each day. The entire process went off without a hitch and even the neighbors were impressed with the quality event! We would recommend Aaron for anyone who needs to do an estate sale. Great communication and customer service! My favorite Estate Sale Co. These guys really know how to make their customers happy. Looking forward to future sales. Thanks again! One of the most organized estate sales I've shopped. Easy to navigate and can always find some cool stuff. The sale went wonderfully. Aaron and his people were genuinely helpful and professional. They were extremely accommodating to us as homeowners and behaved equally towards all he "customers" at the sale. Prices were spot on. They sorted the donations from the "chaff" and hauled away the trash as promised. Aaron was very helpful in referring us to charities for our donations. Aaron was prompt, professional and responsive during the entire process. He sorted, cleaned, and displayed literally thousands of items from our home. Our house was the repository for things from many branches of the family, and there is no way we could have sorted, packaged and distributed it on our own. We tried and gave up about 1/3 of the way through. We found Aaron on Angie's list, and when he came for an estimate we learned that he did all aspects of this process. While we had some "antiques", most of the contents were what we considered "just old stuff'. We did not expect much financially, but welcomed the service of just getting rid of things so that we could actually move. Aaron has a very significant following. He displayed a large number of pictures of the sale items on his web page. The sale ran for three full three days, and although a good deal of items were left, the results far exceeded our expectations. Aaron handled a true estate sale for me last weekend and did a masterful job. It was a house packed full of amazing things -- high end stereo equipment, antique dolls, hundreds of books and CDs, art work, tons of craft and art supplies and loads of crystal, china, high end clothing, knick nacks, clocks and you name it. Thousands (seriously!) of individual items were neatly arranged and priced individually and fairly -- in some cases very inexpensively -- and Aaron and his talented staff dealt with hundreds of shoppers daily with a positive attitude and kindness. They spent two full weeks setting up for the sale, researching values, organizing chaos into a shoppable environment. He even found missing valuables hidden in a Christmas tin and arranged for their sale. He's ethical, a pleasure to deal with, and runs one of the best estate sale services in town. I've been at all of them, and I chose Aaron because I think he is head and shoulders above the rest. 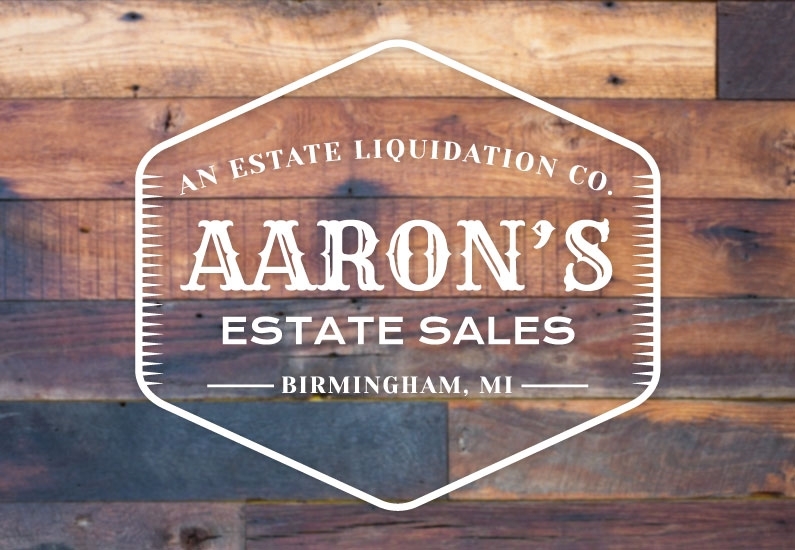 If you need to hold an estate or moving sale, I highly recommend Aaron's. I've encountered several estate sales companies but no one is like Aaron's Estate Sales. When it's comes to professionalism, knowledge, care for the family and managing the sale, Aaron's sets the bar. There are several companies capable of managing estates but Aaron's team truly made this entire process seemsless and put all our worries at bay. So well run...staff, service, everything. Very professional. No fees on credit cards like all the others charge! Did a great job for my family. I have recommended them more than once. I always find something I can't leave without! Their sales are very organized and professional! I've only been to one sale so far but I thought it was very organized and well priced. I'm hesitant to leave this review because I want to keep them all for myself!